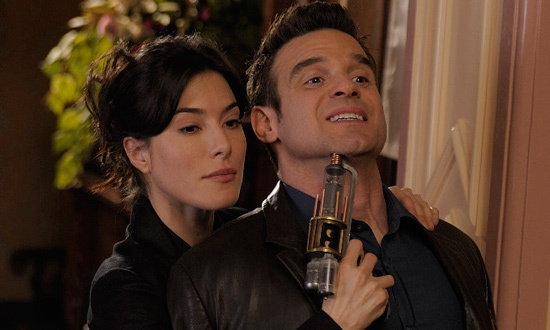 "Syfy Prepping 'Warehouse 13' Spinoff Centered on H.G. Wells Character (Exclusive)"
On Thursday, The Hollywood Reporter published an exclusive made of flowers, puppies, and steampunk Tesla guns. While the franchise of my favorite live-action series of all time has ended, there's a chance that one of my favorite currently airing shows will get a spin off of its own and be the start of a quirky, steam-and-Tesla-powered franchise. Not only that, but this spin-off would be centered around the amazing and complex character of H.G. Wells (portrayed by Jaime Murray), a morally ambiguous time-traveling, inventor-super-agent. Who is a woman. She's the one with the gun. Note the lack of mustache. In case you're wondering: yes, she is that H.G. Wells, but the "H" stands for Helena instead of Herbert and she leads an active life-style of inventing and crime-fighting. No, really. In the wonderfully wacky world of Warehouse, H.G. Wells' stories are written by her brother but based on her life and inventions. "In this incarnation, she would enlist the help of a mechanical engineer and utilize her relationship with the police commissioner to solve what appear to be unsolvable cases. Both the skills and style she employs will become the framework for the well-known stories of H.G. Wells, as written by her brother." I love this idea. Last season, H.G. 's complexity, intelligence, back story, style, moral ambiguity, and jet-pack (as well as Murray's fantastic acting) made her one of my favorite characters in the series (I have twitter proof). She was a good character, whose motivations you could never be completely sure you understood until the end. She kept you guessing and was just fun to watch. WARNING: There may be spoilers about the second season of Warehouse 13, so you should go watch all of it now. This post won't go anywhere. Will the real reason that H.G. was bronzed be explained? The explanation we got last season in Warehouse seemed more like a deflection than the actual reason. It didn't explain Artie's reaction to her or why MacPherson de-bronzed her in the first place. What really happened? The article reveals that in the spin-off, H.G. would be working as a free agent instead of being part of Warehouse 12. Will she still encounter artifacts regularly, or will the show focus more on her inventions? Will she encounter the creators of Warehouse 13's artifacts? As mentioned above, she'll be a free agent. Could this series take place in an alternate timeline from Warehouse 13? The series shares a universe with Eureka, so we know that there are alternate timelines. Is this one? If so, maybe Helena will never take the dark turn that caused her to be bronzed, kill MacPherson, and nearly destroy civilization. The darker aspects of her character could still be explored, but perhaps she would end up as a hero at the end of the day rather than an anti-hero or villain. Perhaps she could see what she might become and that would cause her to make different choices. Will there be a young Mrs. Frederic? Please? Will the police commissioner make a Helena-signal ala Batman? Could she use her time-machine to go back to the 1830's to team-up with Babbage and Lovelace and form the ultimate nerdy steampunk crime-fighting team? Hopefully, the series will get a green light and all of these questions and more will be answered soon. Even as I mourn the ending of one franchise, I shall a wait the birth of another.